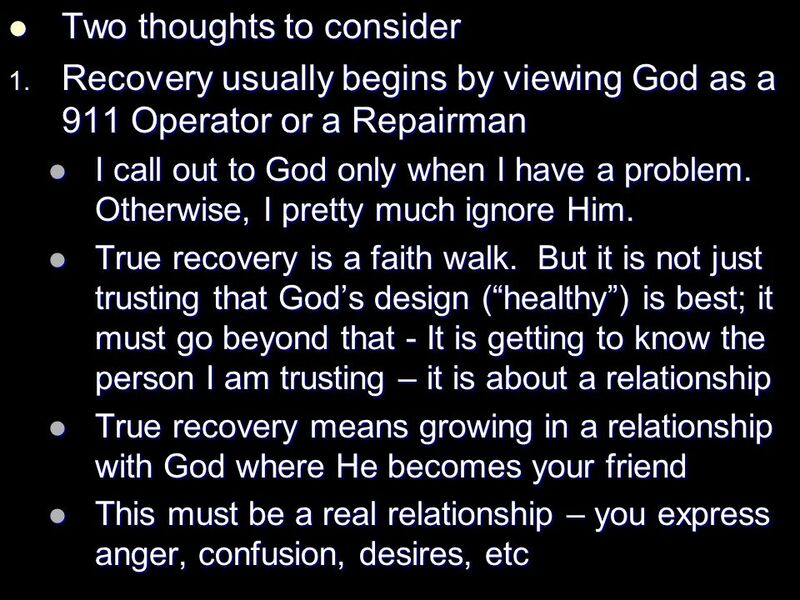 Recovery And Abraham Part 1. 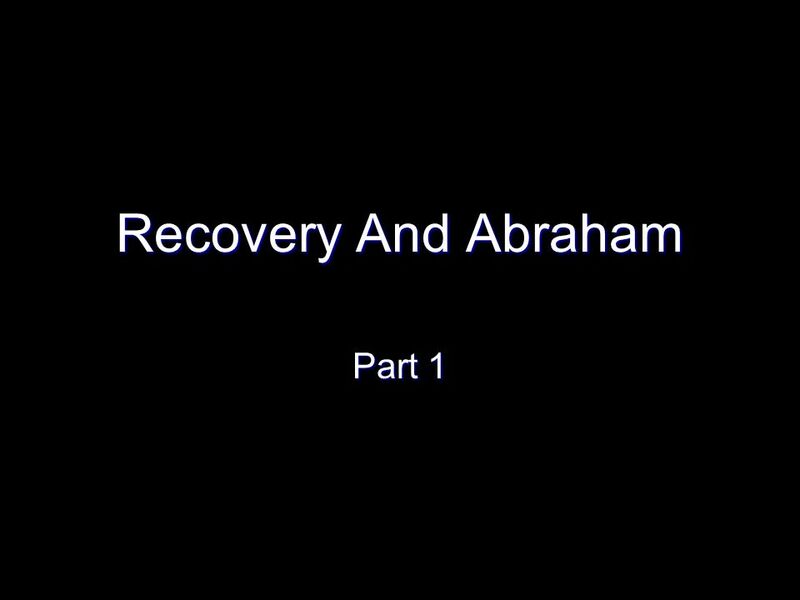 Intro – Recovery and Abraham Try something – parallel recovery and the challenges of recovery with the life of Abraham Try. 8 18. Times when you will have to stand all alone – when you follow God – His design and plan – when no one else is 19. There will be a few times that call for great sacrifice Question – Whats the point? The cost seems to outweigh the benefits Question – Whats the point? The cost seems to outweigh the benefits 1. Abraham – the Friend of God Only person in the Bible who is referred to as a friend of God Only person in the Bible who is referred to as a friend of God Not talking about warm fuzzies Not talking about warm fuzzies This is the greatest blessing anyone can experience This is the greatest blessing anyone can experience To know God intimately, to trust Him totally, which results in total surrender to Him. To know God intimately, to trust Him totally, which results in total surrender to Him. 11 2. If your goal in recovery is just to stay clean, or to get kids, or to get a wife, the cost of recovery will often outweigh the benefit Another way to look at it – why bother doing all this work if I dont end up getting my kids back or getting a healthy spouse? Another way to look at it – why bother doing all this work if I dont end up getting my kids back or getting a healthy spouse? Healthy Attitude – I will fight the good fight of faith for the rest of my life. I cant guarantee that I will get some of the things I want, and that will hurt. But thats OK because my greatest desire is that God become my best friend. I will trust Him with the other desires. Healthy Attitude – I will fight the good fight of faith for the rest of my life. I cant guarantee that I will get some of the things I want, and that will hurt. But thats OK because my greatest desire is that God become my best friend. I will trust Him with the other desires. 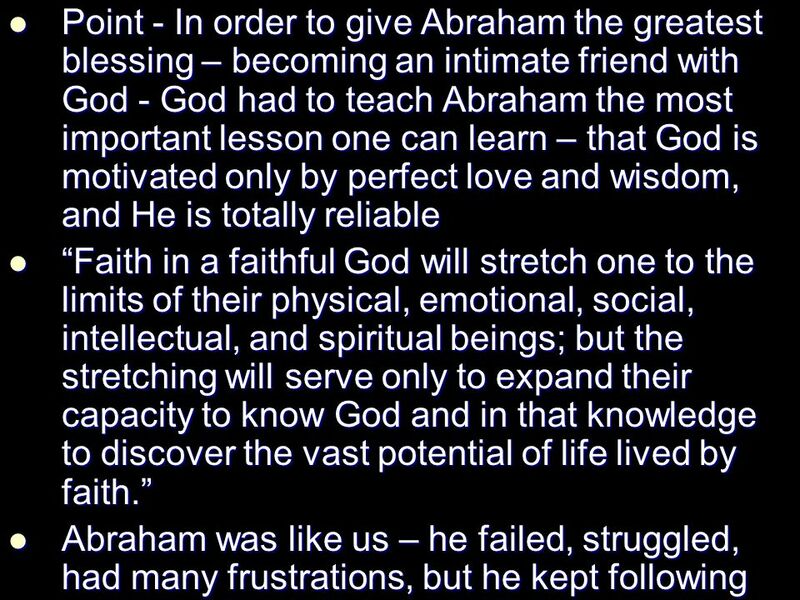 Download ppt "Recovery And Abraham Part 1. 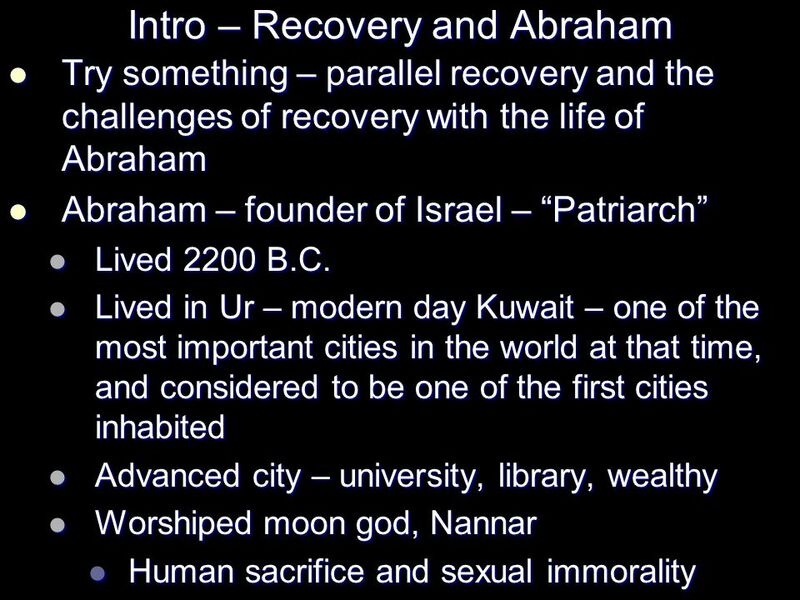 Intro – Recovery and Abraham Try something – parallel recovery and the challenges of recovery with the life of Abraham Try." Who is adequate for this job? Introduction Romans 12:1-2. 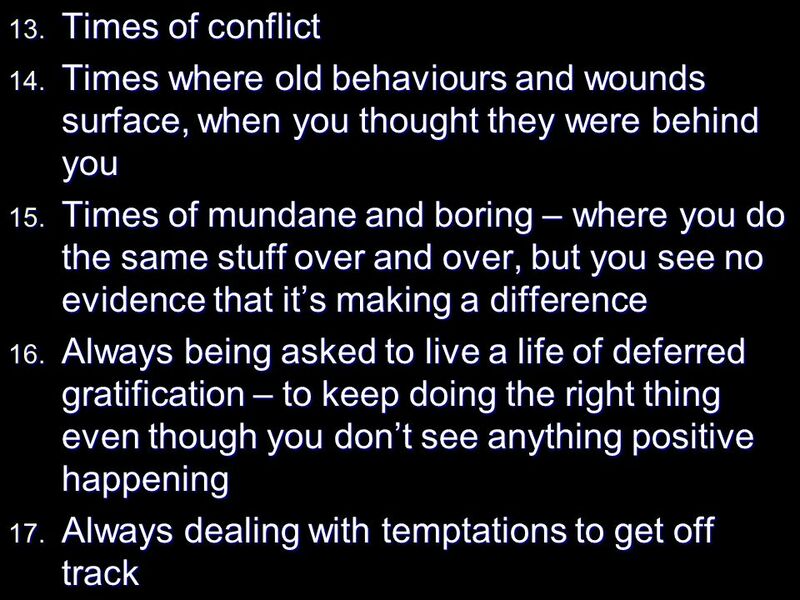 Introduction Romans 12:1-2 God wants us to change transform..renewal. Genesis 12:1 NIV 1 The LORD had said to Abram, "Leave your country, your people and your father's household and go to the land I will show you. Abraham. Who Am I Ruth1:6-22 Jessica Wang. Naomis situation Naomi was left with no sons and no husband. This was a great tragedy. 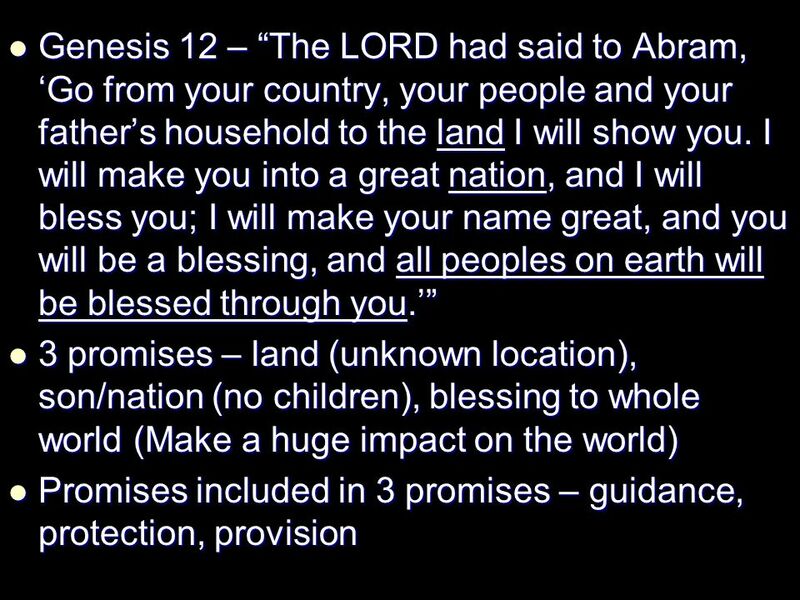 Genesis 12 God Initiates a Covenant with Abram Pastor Craig B. Key, Sr. Living Word Bible Fellowship. 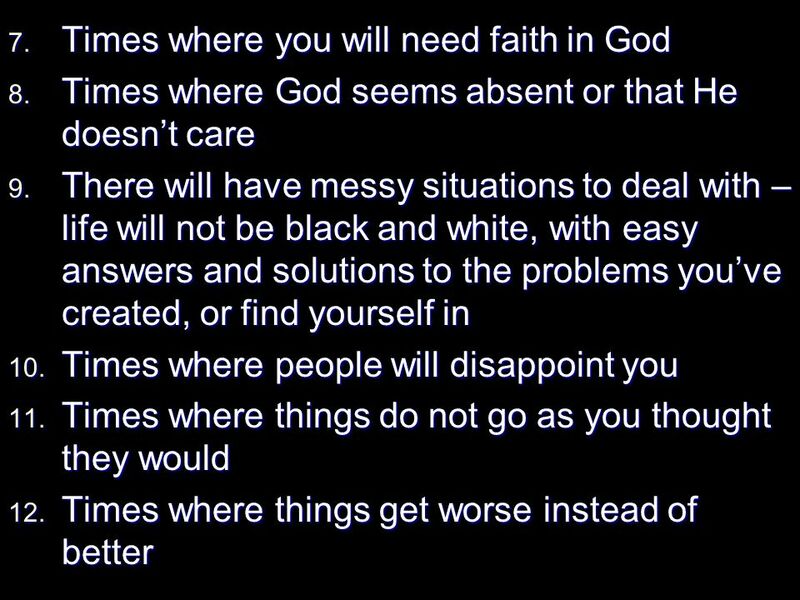 HOW TO LOVE GOD Deuteronomy 6. The Greatest Commandment Matthew 22:37-38 Jesus answered the question: What is the greatest commandment? You shall love. 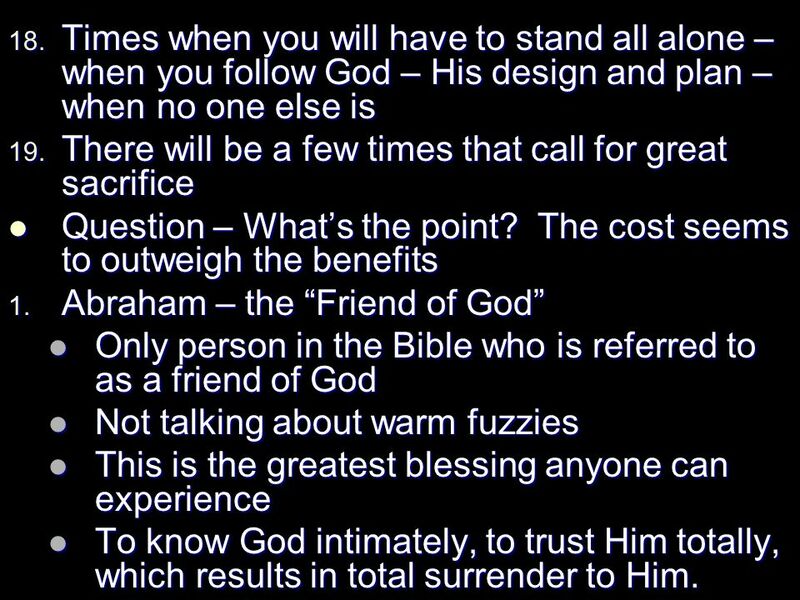 THE 1 ST COMMANDMENT: LOVE GOD ABOVE ALL THINGS Faith Foundations Course One Lesson 4. Seasons of life: Spring & Beyond The Season of Parenting Pastor Paul Hinz "Children are a gift from the Lord." Ps. 127:3 WHAT KIDS NEED MOST FROM PARENTS. 1.Hard work _____ success while failure often ______ laziness. 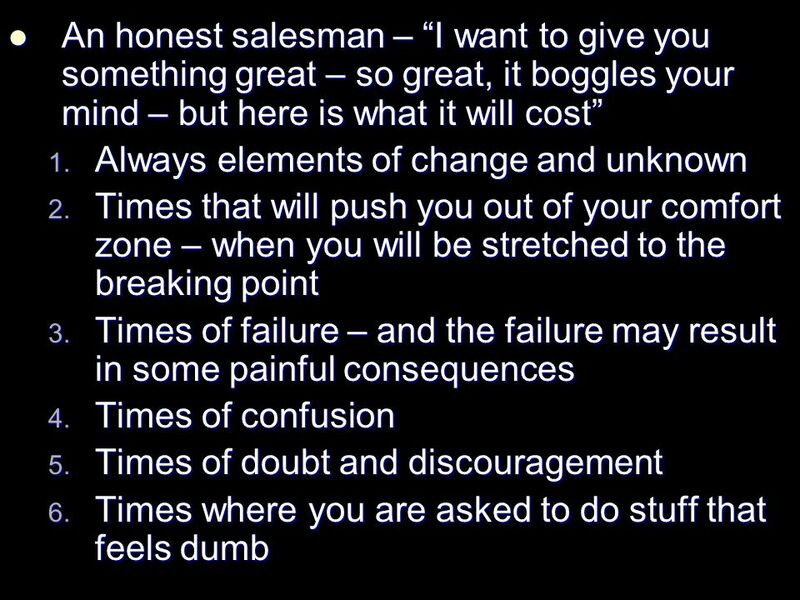 A. lies in; leads to B. leads to; lies in C. leads to; depends on D. lies in; depends on. Mt 6:9-13.    Prayer develops relationship. Intimate prayer helps to develop intimate relationship.  Believing in prayer is not the same as praying. BY FAITH ABRAHAM Genesis 12:1-4 “The LORD had said to Abram, "Leave your country, your people and your father's household and go to the land I will show. Second Chances… Abraham accepts a Second Chance. 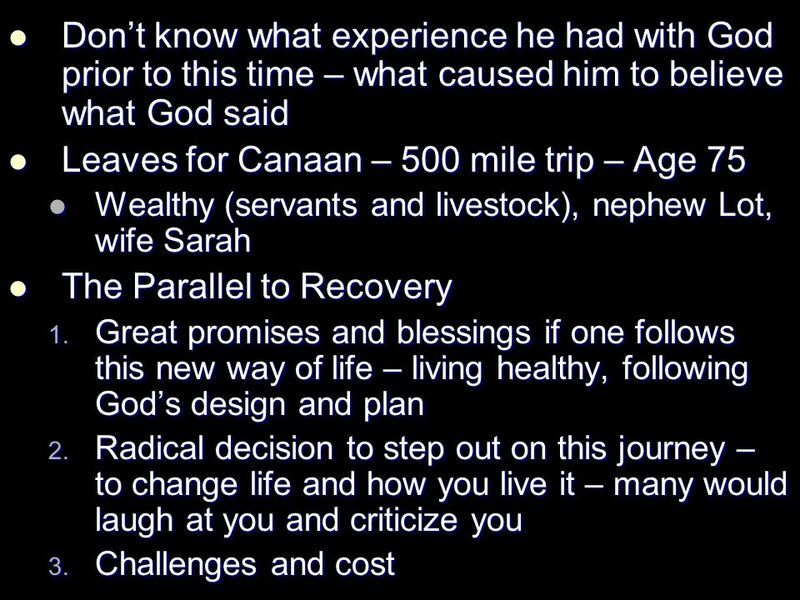 MAN UP BIBLE SERIES Living a Legacy Lesson One. The Real World Time magazine had a cover in 2010 with a picture of a man and his son with the words MAN.